Evaluate your own website here. World News for Children - Articles, biographies, science, reference, tools! 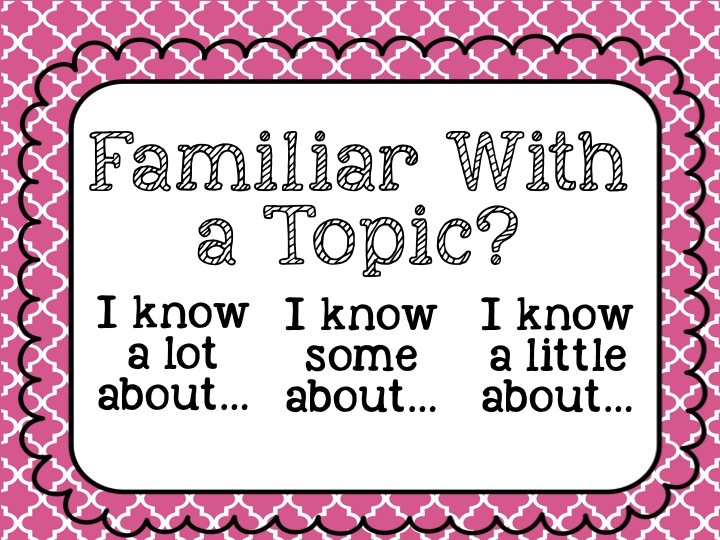 Click here for the Wallwisher for Critical Friends and Group Brainstorming activity. Post your question for research and possible ideas for product. For the product, ask yourself who would be interested in your research and how might you share it with them? Click here for CLASS PL WEBSITE (Spring 2018) for student projects, notes, and reflections. LOG IN REQUIRED to EDIT. Click here for CLASS PL WEBSITE (Spring 2017) for student projects, notes, and reflections. LOG IN REQUIRED to EDIT. Click here for CLASS PL WEBSITE 2015-2016 Round 1 for student projects, notes, and reflections. LOG IN REQUIRED to EDIT. Click here for CLASS PL WEBSITE 2014-2015 Round 2 for student projects, notes, and reflections. LOG IN REQUIRED to EDIT. Click here for CLASS PL WEBSITE 2014-2015 Round 1 for student projects, notes, and reflections. LOG IN REQUIRED to EDIT. Click here for CLASS PL WEBSITE 2013-2015 for student projects, notes, and reflections. LOG IN REQUIRED to EDIT. PL is a student-driven, process-centered opportunity for learners to explore their own interests. Students will be given time and space to identify a challenge, problem or question. Students will plan, manage and reflect upon their learning, with a focus on the process of inquiry. This process allows students the freedom to think independently, take risks, and learn from their attempts. Student work will be documented on the class PL site, which is linked above under "Student Research Questions and PL Projects". THE QUESTION: What do I want to learn? THE FACTS: After doing research, share the facts that I found to be important and/or useful in answering my question. RESOURCES: What resources did I use? List book titles or websites used to locate the above information so others can read more about my topic. NEW UNDERSTANDING: What new understandings do I have about the topic? Why is this information important to know? REFLECTION: Was I able to answer my question? What new questions do I have after this research? What was difficult about this process? What was easy about this process? What will I do next? What do I want to learn about this topic? How do I write a question that is researchable? YES/NO question: The answer to the question is either YES or NO. INCH question: The answer is very short, and usually needs very little research. FOOT question: The question requires some reading through the information you find to answer the question in your own words. YARD question: This question requires some searching in a variety of sources, then combining the information you find, and drawing your own conclusions. Describe one struggle or one success you had. What are your goals for the next session? Post any questions you might have. These sites might spark an idea! Career Research Ideas-What do you want to be? 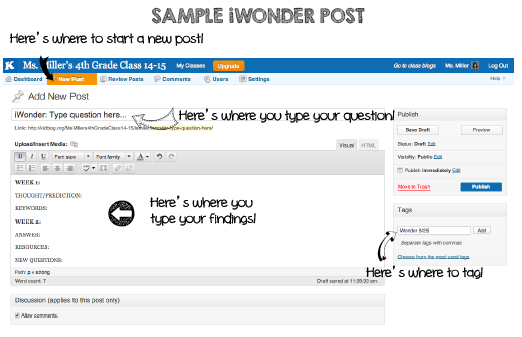 All iWonder posts should be completed on KidBlog. You may copy the format from this post here. Prediction prior to researching the answer. Possible keywords you will use to search. The researched answer to your question using AT LEAST 2 resources. Insert you question as the title of the post. Cut and paste the following into a New Post (do not use the comment feature for this). For this first assignment, we are going to start small. We ask that you click on the link Native American Tribes of Illinois and select a tribe native to Illinois. What would you like to know about this tribe? This first week, we will be asking and answering inch questions. The answers we find will most likely lead us to ask more questions- possibly foot or yard questions. Here is a list of inch questions we brainstormed as a class. Please select one question to research this week. What resources were available to the _______ tribe? On what kind of land did the ______ tribe live? What foods did the ________ tribe eat? In what type of shelter did the ________ tribe live? What type of clothing did the ________ tribe wear? Student choice- keep it simple this week. You will need to use the Internet research skills taught to you by Mrs. Melamed to locate at least two websites that will help you answer your question. A good starting point for your research is the website above. Below the map and list of Illinois tribes is a section called “Illinois Indian Facts for Kids”. Illinois Indian Facts for Kids: Answers to frequently asked questions about Illinois Indians. We currently have pages for the Illini, Miami, Shawnee, Dakota, Sioux, Chickasaw, Winnebago, Delaware, Kickapoo, Ottawa, Potawatomi, Huron-Wyandot, and Sac-Fox tribes. Don’t forget to cite all sources used. You can use the hyperlink button to make an active link to each website. See sample below. The hyperlink button looks like a chain below the Font family button which can be used while in Edit mode. This will help you easily go back to each website as much as you need to. See your teacher for help if needed. Native American Tribes of Illinois. Native Languages of the Americas. http://www.native-languages.org/illinois.htm October 14, 2014.